China Unleashes The Jingoist Rhetoric: "If U.S. Ships Stop, We Should Lock Them By Fire-Control Radar"
"In face of the US harassment, Beijing should deal with Washington tactfully and prepare for the worst. This can convince the White House that China, despite its unwillingness, is not frightened to fight a war with the US in the region, and is determined to safeguard its national interests and dignity. Beijing ought to carry out anti-harassment operations. We should first track the US warships. If they, instead of passing by, stop for further actions, it is necessary for us to launch electronic interventions, and even send out warships, lock them by fire-control radar and fly over the US vessels." "The behavior of the U.S. warship threatened China’s sovereignty and national interest, endangered the safety of the island’s staff and facilities, and harmed the regional peace and stability." Update: According to reports in on Monday evening, the USS Lassen has indeed sailed within 12 nautical miles of China's islands in the Spratlys. As WSJ notes, "an American defense official confirmed Monday that the U.S. Navy ship navigated through the waters around at least one of the land masses to which China lays claim within the Spratly chain of islands in the South China Sea, crossing an area that China maintains is part of its sovereign territory." WSJ also reiterates that this isn't likely to be a one-off event. As noted below, most "experts" believe that in order for this to be effective from a deterrence standpoint, the US will need to step up the patrols, presumably in an effort to prove to Beijing that the Pentagon is "serious", whatever that means in this context. The ball is now squarely in China's court. The PLA has already promised to "stand up and use force" in the event its territorial sovereignty is violated. The question now is whether Beijing will back down and concede that "sovereignty" somehow means something different with regard to the islands than it does with respect to the mainland or whether Xi will stick to his guns (no pun intended) and take a pot shot at a US destroyer. For anyone who might still be somehow unaware, the US is currently in a superpower staring match with both Russia and China. The conflict in Syria has put Moscow back on the geopolitical map (so to speak), creating an enormous amount of tension with Washington whose regional allies have been left to look on in horror as Russian airstrikes and an Iranian ground incursion dash hopes of ousting President Bashar al-Assad. Meanwhile, in The South China Sea, Beijing has built 3,000 acres of new sovereign territory atop reefs in the Spratlys and although the reclamation effort itself isn’t unique, the scope of it most certainly is and Washington’s friends in the South Pacific are crying foul. After that, an intense war of words developed with Defense Secretary Ash Carter insisting that the US would sail and fly anywhere it pleased and Beijing assuring the US that sailing within 12 nautical miles of the islands would prompt a harsh response from the PLA. For weeks, the US was rumored to have been planning a freedom of navigation exercise in the Spratlys which, as we’ve pointed out several times this month, amounts to sailing by the islands just to see if China will shoot. The US navy is poised to start freedom of navigation operations in the South China Sea in a high-stakes effort to push back against Chinese territorial claims over artificial islands in the disputed waters. In a move that will enrage Beijing, the USS Lassen, a guided-missile destroyer, will sail inside the 12-nautical mile zones of two man-made islands — Subi and Mischief reefs — that China has built in the contested Spratly Island chain. A senior US defence official said it would sail through the area in the early hours of Tuesday morning. China has repeatedly warned that it would not tolerate any effort to violate what it considers its territory. Earlier this month, a senior Chinese naval officer said the People’s Liberation Army would hand a “head-on blow” to any foreign forces that violated Chinese sovereignty. His comments came after the Financial Times reported that the US was poised to launch its operations. The manoeuvre will mark the first time since 2012 that the US navy has sailed through the 12-nautical mile zone surrounding any islands claimed by China. It is aimed at demonstrating that Washington does not recognise any territorial claims over artificial islands in the South China Sea. A range of security experts said Washington's so-called freedom of navigation patrols would have to be regular to be effective, given Chinese ambitions to project power deep into maritime Southeast Asia and beyond. "This cannot be a one-off," said Ian Storey, a South China Sea expert at Singapore's Institute of Southeast Asian Studies. "The U.S. navy will have to conduct these kinds of patrols on a regular basis to reinforce their message." But China would likely resist attempts to make such U.S. actions routine, some said, raising the political and military stakes. China's navy could for example try to block or attempt to surround U.S. vessels, they said, risking an escalation. Not to put too fine a point on it, but this borders on the insane. Here we have both Washington and Beijing risking an outright military confrontation over what amount to a couple of sandcastles and while there's probably some truth to the contention that China has plans for the islands that go beyond growing plants, building lighthouses, and raising pigs, it's not as though the PLA is going to invade The Philippines so at the end of the day, this looks like another example of what Vladimir Putin recently suggested is evidence that the world is losing its collective mind. In August 2015, IBM learned that the SEC is conducting an investigation relating to revenue recognition with respect to the accounting treatment of certain transactions in the U.S., U.K. and Ireland. The company is cooperating with the SEC in this matter. While we await the full Twitter slidedeck presentation, here are the key results as they come in. Quarterly profits and revenue at big American companies are poised to decline for the first time since the recession, as some industrial firms warn of a pullback in spending. From railroads to manufacturers to energy producers, businesses say they are facing a protracted slowdown in production, sales and employment that will spill into next year. Some of them say they are already experiencing a downturn. “The industrial environment’s in a recession. I don’t care what anybody says,” Daniel Florness, chief financial officer of Fastenal Co., told investors and analysts earlier this month. A third of the top 100 customers for Fastenal’s nuts, bolts and other factory and construction supplies have cut their spending by more than 10% and nearly a fifth by more than 25%, Mr. Florness said. Caterpillar Inc. last week reduced its profit forecast, citing weak demand for its heavy equipment, and 3M Co., whose products range from kitchen sponges to adhesives used in automobiles, said it would lay off 1,500 employees, or 1.7% of its total, as sales growth sagged for a wide range of wares. The weakness is overshadowing pockets of growth in sectors such as aerospace and technology. Industrial companies are being buffeted on multiple fronts. The slump in energy prices has gutted demand for drilling equipment and supplies. Economic expansion is slowing in China and major emerging markets such as Brazil, which U.S. companies have relied on for sales growth. And the dollar’s strength also has eroded overseas profits. The drag on earnings and sluggish growth projections for next year come as the Federal Reserve considers raising interest rates for the first time in nine years, and could add momentum to those in favor of postponing any rate increase until next year. Profit and revenue are falling in tandem for the first time in six years, with a third of S&P 500 companies reporting so far. Analysts expect the index’s companies to book a 2.8% decline in per-share earnings from last year’s third quarter, according to Thomson Reuters. Sales are on pace to fall 4%—the third straight quarterly decline. 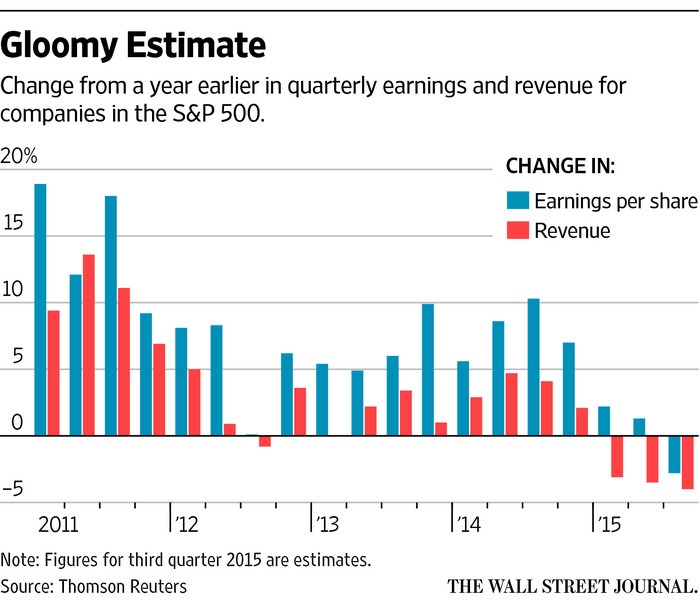 The last time sales and profits fell in the same quarter was in the third period of 2009. At some companies, foreign-currency effects hurt results significantly. Consumer-products maker Kimberly-Clark Corp. predicted that currency swings would slash earnings by 25% this year, while Johnson & Johnson said that the dollar’s moves would reduce sales growth by almost 7 percentage points this year, even without further fluctuations. This week, another third of the S&P 500 are expected to report their results, including such giants as Apple Inc., United Parcel Service Inc. and Exxon Mobil Corp.
Much of the anticipated decline stems from the hard-hit energy industry, where sales are expected to drop by more than a third from a year earlier and profits are likely to plummet 65%, Thomson Reuters says, based on analysts’ estimates. Basic-materials companies face a 17% drop in profits, and industrial sales are expected to decline more than 5%. United Technologies Corp., which makes Otis elevators and Carrier air conditioners, said it expects profits to be flat or down in three of its four operating segments next year, despite strength in its U.S. operations. Chief Financial Officer Akhil Johri told investors last week that the Otis division’s sales in China fell 19% in the third quarter as commercial construction slumped. Other companies voiced similar concerns. “If you look at kind of the broad industrial-production index, you see industrial production sequentially coming down,” said Fredrik Eliasson, chief sales and marketing officer at railroad operator CSX Corp.
CSX is scaling back some operations in response to declining coal shipments as power plants switch fuels, eliminating nearly 500 jobs in Corbin, Ky., and Erwin, Tenn. In the current quarter, the company plans to reduce its average head count by 2% from the third-quarter level. U.S. manufacturing production rose in September at its slowest pace in more than two years, the Institute for Supply Management reported earlier this month. Economic activity at 11 industries tracked by the group contracted during the month, while just seven reported growth. Meantime, manufacturers told ISM that customer inventories remained high, contributing to a slowdown in new orders. Still, cost-cutting continues. Companies from Twitter Inc. and Biogen Inc. to Wal-Mart Stores Inc. and Monsanto Co. have announced job cuts in recent weeks. That could boost the U.S. unemployment rate, which ended September at 5.1%, its lowest point since April 2008. Indeed, low fuel prices have boosted U.S. car sales and buoyed airlines’ results, and the U.S. construction market remains robust. And, even among manufacturers, the aerospace industry is doing well. Technology giants Amazon.com Inc. and Microsoft Corp. posted strong results on Thursday, as did Google parent Alphabet Inc.
Others worry that the slowdown is spreading to consumer businesses. Wal-Mart recently warned its sales this year are likely to be flat, down from projection of as much as 2% growth, and cut its earnings forecast for next year as it raises wages. The retailer blamed the strong dollar for the weakening sales growth. And truckload carriers have warned that they aren’t witnessing the usual uptick in retailer demand as the holiday season approaches, thanks to stubbornly high inventories, said Alex Vecchio, a transportation analyst at Morgan Stanley. “Transportation companies are typically a leading indicator, and our data is not good,” Mr. Vecchio said. FRA Co-Founder Gordon T. Long discusses the Austrian School of Economics with John Butler and how its methodologies can be applied to the current global economy. John Butler has 18 years’ experience in the global financial industry, having worked for European and US investment banks in London, New York and Germany. The Austrian school believes that economics systems are ultimately information systems. Some of those systems use information more efficiently and effectively than others, and in particular systems of which authorities of various kinds meddle with the market. Authorities may do this by extracting capital from the market via tax rates or even by manipulating the money of that market through some sort of artificial interest rate policy. Without the rule of law, without the ability to strongly enforce property rights, without the ability to prosecute fraud, and various other legal frameworks; the Austrian economic model cannot work. Austrianism teaches us that the future is unpredictable. The economy is made up of the billions of people in the world, with each person making transactions almost every day. Each decision is an individual’s choice, and each decision, even the decision not to spend your money has some effect on the economy. Income growth has not kept up; assets are expensive relative to incomes. So the correct strategy is not simply to short assets, which is dangerous; but if indeed they do look for ways to stimulate aggregate demand more directly rather than through the banking system. The correct strategies to have today are those that will perform if incomes begin to catch up to asset prices, it could be asset prices declining towards incomes or vice versa. It is impossible to know which one is going to happen, but it is highly likely looking forward that a conversion of the two will happen. Prevent investors being able to freely liquidate or withdraw funds from their existing investments. This of course is very anti-capitalist, very inti-market. It goes directly against everything that a free enterprise economy should stand for; but when you follow these policies you will eventually get to a dead end. FRA Co-Founder Gordon T. Long interviews Leland miller, the president of the china beige book international and discusses financial repression in the context of the Chinese economy. He describes himself as a Lifelong china watcher who decided to do something about the complete lack of data in china. “One of the things that the china beige book plans to do is to give people a real picture of not just the growth dynamics, but also the labor market, the credit dynamics, the macro implications of Chinese growth, indications of future Chinese demand, implications of commodity markets around the world, we try to give the people a much better picture on what’s actually happening instead of just relying on official data and press release”. Leland describes the Chinese reform as a reversal of financial repression and this repression in the context of the Chinese economy is the oppression of consumers and households by state organizations through its economic systems. “It means reversing this long time economic model, where the state will profit through the economic system at the expense of the consumers and household, and one of the things that the new leadership is intent on doing in order to create consumption is to empower consumers, so they spend more and stop empowering state organizations which are fuelling the overcapacity and the massive debt bubble”. What should investor know about china? He explains the biggest misconception concerning the Chinese economy is believing the GDP tells you much about how china is doing. “It is a broad, blunt indicator that doesn’t measure productive growth or credit dynamics”. On some of the challenges of getting reliable data in china, Leland explains that he and his team had to ask Chinese firms and consumers on ground what is happening in the country, and set up a number of polling units across sectors in order to get reliable and accurate information. “For years we have been talking about the Chinese slowdown; it’s inevitable, despite the fact that the economy has been slowing”. He goes on to explain that although the market sentiment has gone from optimism to “Armageddon” in recent months, the actual data is at odds with these sentiments. As a result of china’s economic slowdown, there is great vulnerability among emerging markets. Now, the reason for this is that for years these markets have relied on china’s demand without factoring the likelihood of a decline or certainty of a decline in china’s demand. “The Chinese look at America as a model that they are interested in taking pieces from; they like the dynamism of the economy and the global status. On one hand, they see us as a model to learn a lot of things from but also as a serious threat that is looking to constrain their inevitable and ultimate rise”. The last time we observed one of our long-standing favorite topics (first discussed in early 2009), namely the global USD-shortage which manifests itself in times of stress when the USD surges against all foreign currencies and forces even the BIS and IMF to notice, was in March of this year, when we explained that "unlike the last time, when the global USD funding shortage was entirely the doing of commercial banks, this time it is the central banks' own actions that have led to this global currency funding mismatch - a mismatch that unlike 2008, and 2011, can not be simply resolved by further central bank intervention which happen to be precisely the reason for the mismatch in the first place." Furthermore JPM conveniently noted that "given the absence of a banking crisis currently, what is causing negative basis? The answer is monetary policy divergence. The ECB’s and BoJ’s QE coupled with a chorus of rate cuts across DM and EM central banks has created an imbalance between supply and demand across funding markets. Funding conditions have become a lot easier outside the US with QE-driven liquidity injections and rate cuts raising the supply of euro and other currency funding vs. dollar funding. This divergence manifested itself as one-sided order flow in cross currency swap markets causing a decline in the basis." To which we rhetorically added: "who would have ever thought that a stingy Fed could be sowing the seeds of the next financial crisis (don't answer that rhetorical question)." All this was happening when the market was relentlessly soaring to all time highs, completely oblivious of this dramatic dollar shortage, which just a few months later would manifest itself quite violently first in the Chinese devaluation and sale of Treasurys, and then in the unprecedented capital outflow from emerging markets as the great petrodollar trade - just as we warned in November of 2014 - went into reverse. In fact, there are very few now who do not admit the Fed is responsible for both the current cycle of soaring volatility, or what may be a market crash (as DB just warned) should the Fed not take measures to stimulate "inflation expectations" (read: more easing). The dollar fx basis declined further over the past two months. The 5-year dollar fx basis weighted across six DM currencies declined to a new low for the year and the lowest level since the summer of 2012 during the euro debt crisis. In other words: the USD funding shortage is even worse than it was when we looked at it in March, it still is a function of conflicting central bank liquidity flows, and while not as bad as it was at its all time worst levels in late 2011, it is slowly but surely getting there with every passing week that the Fed does not ease monetary conditions. Similar to the beginning of this year, the decline in the dollar fx basis is raising questions regarding shortage in dollar funding. This is because the fx basis reflects the relative supply and demand for dollar vs. foreign currency funds and an even more negative basis currently points to more intense shortage of USD funding relative to the beginning of the year. Figure 5 shows that the current negativity of the dollar fx basis represents the third major episode since the Lehman crisis. Before the Lehman crisis the fx basis was remarkably stable hovering around zero as funding markets were well balanced. After the Lehman crisis, funding markets experienced persistent imbalances with an almost structural shortage of dollar funding. In all, continued monetary policy divergence between the US and the rest of the world as well as retrenchment of EM corporates from dollar funding markets are sustaining an imbalance in funding markets making it likely that the current episode of dollar funding shortage will persist. What does this mean in simple terms? Think back to what David Tepper said several weeks ago on CNBC when, contrary to popular opinion, he admitted he was bearish on risk assets mostly as a result of the "reserve streams" going in two different ways. This is precisely what the dollar shortage as quantified by the negative dollar basis is telling us: the policy divergence between the "tight" Fed and the ultra loose ECB and BOJ is starting to reach extreme levels, and will likely continue until the basis blows out to its theoretical limit of -50bps as set by the Fed-ECB swap line. At that point either the Fed will be forced to admit it was beaten by the market, and either cut rates (to negative) while perhaps unleashing even more QE to offset the monetary imbalance with the rest of the world, or it will once again engage in even more swap lines with foreign central banks as the dollar funding shortage moves beyond simply synthetic and into an actual shortage of USD "bills" all in electronic credit format of course, because as we further explained last week, it is simply impossible to satisfy all global USD-denominated claims. Even a casual glance at the IMF’s World Economic Outlook statistics for Russia shows the tight correlation since 1992 between GDP growth on the one hand and oil and gas output, exports, and prices on the other (economic series available here). According to the IMF’s 2015 Article Iv Consultation-Press Release and Staff Report, published August 3, oil and natural gas exports comprised 65 percent of exports, 52 percent of the Federal government budget, and 14.5 percent of GDP in 2014. Including their domestic contribution, hydrocarbons represent ~30 percent of GDP. - The revenues Russia can earn from its crude and natural gas exports face intense pressure. The Saudi decision to let the market set prices and to pursue market share, has led to steep declines in crude and petroleum product prices. The decision also has impacted natural gas export prices negatively, since, for Russia’s long-term supply agreements, they wholly or partially are indexed to oil prices. The transition in Europe to hybrid natural gas pricing models (which take European spot hub prices into account) also has pressured natural gas pricing. (Natural gas data from Gazprom). - The U.S. and European Union’s decisions to impose—and maintain—sanctions on Russia after its invasion and annexation of Crimea and invasion and informal annexation eastern Ukraine will pile more pressure on the Russian energy industry. They include bans on financing for and the supply of critical equipment and technology to important Russian energy projects. Novatek and its partners Total and Chinese National Petroleum Company still lack $15 billion of the $27 billion needed to finance the Yamal LNG plant. Denis Khramov, Russia’s deputy Minister of Natural Resources, said September 28 at a conference in Russia’s Far East that Rosneft and Gazprom are delaying some offshore drilling by two to three years because of sanctions and low oil prices. The sanctions are also impeding Gazprom’s ability to develop the Chayandinskoye and Kovyktinskoye fields in eastern Siberia, from which it plans to supply natural gas to China under the bilateral $400 billion, thirty year deal signed in 2014. - Following the Russian invasion of Crimea and eastern Ukraine, The European Union is now even more determined to reduce its dependence on Russia for natural gas and to force Gazprom submit to EU competition rules. Europe has sought and continues to seek alternatives Russian natural gas (among them, U.S. LNG and Iranian pipeline and/or LNG). The European Commission, the European Union’s executive body, has refused to bless Gazprom’s proposed 55 bcm/year Nord Stream 2 natural gas pipeline project, citing existing surplus Gazprom pipeline capacity into Europe and insufficient future demand for Russian natural gas. Also, the EU Commission in April charged Gazprom with violating the EU’s anti-trust laws for anti-competitive practices and unfair pricing in Central and Eastern Europe. If found guilty, Gazprom could face substantial fines of around $1 billion. Even if Gazprom avoids fines and manages to reach a settlement with the EU, as it hopes to do, its European market share and pricing will remain under pressure into the future. - The emergence of the U.S., along with Canada, as powerful crude, NGL, and natural gas producers is also a major concern for the Russian economy. This has transformed the U.S. from a market for Russian crude and natural gas (via LNG) to a global competitor. If, as seems increasingly likely, the ban on crude exports is lifted, U.S. crude will compete with Russian crude in several key markets. It would also force foreign suppliers to seek other markets for all or part of the exports they previously sent to the U.S. This in turn would intensify competition among these crude exporting countries for share in those markets. In regard to natural gas, its explosive output growth in the U.S. undercut Gazprom’s rationale for its Baltic LNG project (10 mtpa), turned the U.S. into a major (potential) LNG competitor in global LNG import markets, and, via the U.S. toll- and Henry Hub- pricing model, weakened Gazprom’s ability to insist on oil-indexed, long-term contracts. Putin’s moves also are strengthening Russia’s influence with OPEC. Russia already has extensive and close ties with Iran and Venezuela, and is now laying the basis for such ties with Iraq. Putin has aligned Russia with OPEC’s have nots–the members lacking financial resources to withstand low crude prices for an extended period and that have objected to Saudi policies (Iran, Iraq, Angola, Nigeria, Libya, Algeria, Ecuador, and Venezuela)—against the haves (Saudi Arabia, Kuwait, the UAE, and Qatar). He has continually supported Venezuelan President Maduro’s calls for an emergency OPEC meeting on prices and his efforts to persuade Saudi Arabia to reverse its policy. Most recently, in the beginning of September, Putin told Maduro that the two countries “must team up to shore up oil prices”. In addition, Russia’s deputy prime minister in charge of energy policy, Arkady Dvorkovich, in the beginning of September made comments that, in tone and substance, mocked Saudi policy, saying that “OPEC producers are suffering the ricochet effects of their attempt to flush out rivals by flooding the world with excess output,” expressing doubt that OPEC members “really want to live with low oil prices for a long time,” and implying that Saudi policy is irrational. Russia also could cooperate with Iran and Iraq to take market share from Saudi Arabia in the vital Chinese market.As a recent Bloomberg article pointed out, Saudi Arabia, Iran, Russia, Iraq and other countries are vying intensely for sales to China, the second largest import market and the major source of demand growth in coming years. Coordinating their pricing and consistently offering the Chinese prices below the Saudi price, they could seek to win market share. Such a price war would pressure the competitors’ currencies. As oil prices are now hovering around $45 per barrel, the entire oil and gas industry is looking forward to the next OPEC meeting, due to be held on December 4 this year in Vienna. On October 14, non- OPEC member Mexicoconfirmed its participation in a technical meeting organized by the cartel on October 21 in Vienna to which seven other non-OPEC members were also invited. “We are going with a technical delegation to receive information and exchange it with other producers. But Mexico will not take part in any reduction in production volume,” said Mexico’s Energy Minister Pedro Joaquin Coldwell. The meeting was held last Wednesday and was attended by representatives of five countries: Russia, Brazil, Kazakhstan, Colombia and Mexico. The main agenda of the meeting was to exchange different market views and create a common strategy in response to the current market conditions and low oil prices. What exactly happened at the meeting? Venezuela has been the most vocal OPEC member when it comes to the issue of raising oil prices by altering the cartel’s production levels. During the technical meeting between OPEC and non-OPEC members, Venezuela proposed that OPEC must resume its policy adopted in 1980s of fixing the oil price. It suggested a possible ceiling price of $88 per barrel which would naturally require OPEC to reduce its current production levels. In addition, Venezuela also proposed another technical meeting of this kind to be held during the upcoming Dec 4 meeting. “We are concerned about the depletion of reservoirs and about the decline of production. We are talking here about an equilibrium price to sustain the production,” said Venezuela’s Oil Minister Eulogio del Pino in response to his nation’s stand on the OPEC production levels. Although it was agreed that a similar meeting would be held again after December 4 for assessing the global oil markets, Venezuela’s proposal of reducing the production levels for setting a specific ceiling price was not even discussed. With Russia and other non–OPEC members refusing to stand by Venezuela, the meeting re-iterated OPEC’s policy of sticking to its production levels instead of reducing them. Although Venezuela has received support from other OPEC members such as Ecuador and Algeria to some extent, the OPEC leaders dismissed any further speculations on production cuts. With this firm stand, it is possible that we might witness the formation of two blocks within OPEC during the next December 4 meet in Vienna. One, led by Venezuela, Ecuador, Libya and Algeria that would want to reduce production levels and the other led by Saudi Arabia, UAE and Kuwait that would stick to the current strategy of defending market share. Iran may have a neutral stance as, although it ‘urged’ the other OPEC members to reduce their combined production to maintain a ceiling of $70-$80 per barrel, Iran would itself be ramping up its production levels to regain its lost market share, once the western sanctions against it are lifted. What does this decision mean for the future of OPEC and the oil industry? “OPEC made it very clear months ago they will not interfere to control prices and it is the market that should do that,” said one of the OPEC delegates during the meeting. It is quite clear that even Russia (which produced around 10.74 mb/day in September, a new post- Soviet Era record) is not interested in reducing its output and is competing directly with Saudi Arabia in markets like Europe and Asia, battling for market share. On the one hand, the Saudis are offering discounts to customers in Asia, Europe and the U.S. On the other, Russia is competing hard with Saudi Arabia in Eastern Europe and China. In any case, a potential OPEC cut in production levels would not be the complete solution to the problem of the global supply glut as the U.S. shale patch has nearly doubled its production, up by 4 million barrels per day between the year 2011 and 2015, arguably making them more responsible for the supply glut and current oil price crash. In the end, it will come down to survival of the fittest. Players who have higher breakeven costs will be the ones who will blink first and thereby reduce their production levels. In the present scenario, the U.S. shale drillers, who have very high breakeven costs, are going out of business and we are already witnessing how U.S. production is falling every month since April. Still, oil prices remain below the $50 per barrel mark. The ‘survival of the fittest’ also applies to Middle East oil producers, and especially to Saudi Arabia, the undisputed leader of OPEC. As widely reported by the media, the International Monetary Fund has warned that Saudi Arabia is now facing the possibility of going broke in the next five years, while the other Middle Eastern nations like the UAE, Kuwait and Qatar have foreign reserves that could last for almost twenty years. The desert kingdom is now facing a massive budget deficit of $36.8 billion according to its 2015 budget figures and is burning its foreign reserves at an alarming pace. Although Saudi Arabia is responding to this crisis by cutting spending, postponing several projects and by attracting foreign investment, is it doing enough to salvage the situation? Many experts now believe that Saudi Arabia will eventually be compelled to cut its production levels as its rising budget deficit will leave the desert kingdom with no other option. And, with Saudi Arabia deciding to cut the production, we can expect oil prices to bounce back in the longer run. Until then, oil prices will continue to remain bearish and volatile. Although it is almost certain that OPEC will not change its strategy in its next meeting in Vienna, it is unlikely that it would maintain this stance for too much longer in 2016. Over the course of the last several months, the consequences for Saudi Arabia of deliberately keeping crude prices suppressed in an effort to, i) bankrupt uneconomic producers in the US, and ii) pressure Moscow into giving up Bashar al-Assad have begun to make themselves abundantly clear. ... but the pressure from simultaneously maintaining the riyal peg and preserving the standard of living for everyday Saudis has driven Riyadh back into the debt market in an effort to offset some of the pressure on the country’s vast store of USD-denominated petrodollar assets (see second pane below). Meanwhile, the war in Yemen is also weighing on the budget and now, the Saudis are staring down a fiscal deficit that amounts to some 20% of GDP and the first current account deficit in years. All of the above have caused to market to lose faith in Riyadh’s ability to keep the situation under control and now,S&P has downgraded the kingdom to AA- negative citing “lower for longer” crude and the attendant ballooning fiscal deficits. We expect the Kingdom of Saudi Arabia's (Saudi Arabia's) general government fiscal deficit will increase to 16% of GDP in 2015, from 1.5% in 2014, primarily reflecting the sharp drop in oil prices.Hydrocarbons account for about 80% of Saudi Arabia's fiscal revenues. Absent a rebound in oil prices, we now expect general government deficits of 10% of GDP in 2016, 8% in 2017, and 5% in 2018, based on planned fiscal consolidation measures. We are therefore lowering our foreign- and local-currency sovereign credit ratings on Saudi Arabia to 'A+/A-1' from 'AA-/A-1+'. Standard & Poor's is converting its issuer credit rating on Saudi Arabia to "unsolicited" following termination by Saudi Arabia of its rating agreement with Standard & Poor's. The outlook remains negative, reflecting the challenge of reversing the marked deterioration in Saudi Arabia's fiscal balance. We could lower the ratings within the next two years if the government did not achieve a sizable and sustained reduction in the general government deficit or its liquid fiscal financial assets fell below 100% of GDP.